Rüsselsheim. Safety on rough terrain like construction sites is at a premium, also where vehicles are concerned. 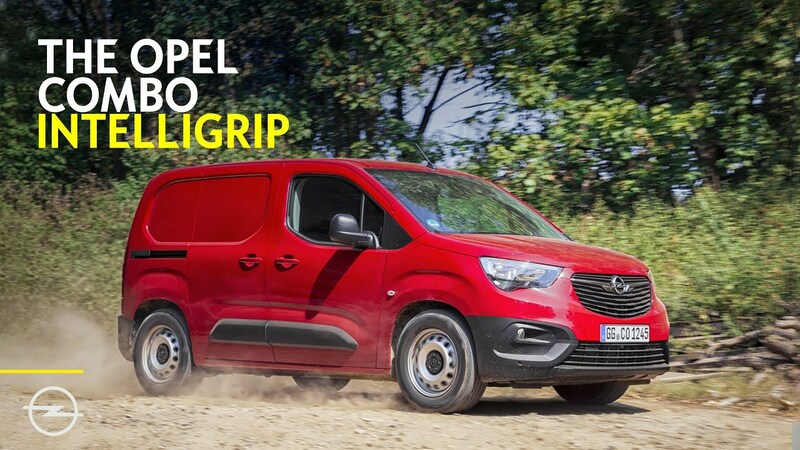 But accidents can be avoided with the right car, equipment and options, such as the new Opel Combo compact van with IntelliGrip adaptive traction control and Worksite pack. IntelliGrip endows the front-wheel drive Combo – the 2019 International Van of the Year – with optimum traction and stability in a variety of driving conditions. Depending on the surface, the driver simply selects the appropriate traction control mode via the rotary dial on the centre console. The electronics then immediately adapt torque distribution to the wheels and the ESP settings (electronic stability program) to the selected mode. Normal / On-road: ‘Normal mode’ is activated as soon as the Combo is started. ESP and traction control are calibrated for normal driving conditions downtown, on the motorway or in the countryside. Snow: ‘Snow mode’ enables optimum traction on icy and snowy surfaces at speeds up to 50 km/h. Traction control regulates the slip of the front wheels, slowing down the spinning wheel and transferring the torque to the other front wheel. Mud: This mode allows more wheel slip. This intentional spinning of the wheel with the least traction when the vehicle is launching enables the removal of mud from the tire, which can then regain traction. Meanwhile, the wheel with the most grip is provided with the highest torque. This mode is active up to 80 km/h. Sand: This mode allows a small amount of simultaneous spin of both the front-driven wheels, enabling the vehicle to move and reducing the risk of sinking. ESP Off: This deactivates ESP and traction control at speeds up to 50 km/h. For safety reasons, IntelliGrip automatically returns to ‘normal mode’ at speeds above 50 km/h. IntelliGrip thus adapts torque distribution to the front wheels according to the selected mode, allowing slip when necessary and thus creating the optimum balance between grip and wheel-spin. In addition to the extra traction of IntelliGrip, protection on rough surfaces for the Combo, its driver and crew is provided by the Worksite option. This equipment package includes Hill Descent Control, 30 mm higher ground clearance, a stiffer front anti-roll bar and a reinforced rear crossmember, taller diameter tyres, variable rate rear springs and a metal sump guard under the engine compartment. The new Combo offers a wide choice of variants for drivers and crews, including a standard length of 4.40 metres, a longer XL-version with 4.75 m and a spacious five-seater crew cab. The range of 1.5-litre diesel engines already meets the stringent Euro 6d-TEMP emissions standard. Opel’s new compact transporter can also carry more than most of its main competitors, with a load capacity of up to 4.4 cubic metres, a payload of up to 1,000 kilogrammes and a load length of up to 3,440 millimetres. Especially practical is the wide space between the rear wheel arches, so that the Combo can transport up to two Euro pallets – even the short wheelbase version. Very long objects such as planks can be stowed at an angle thanks to the optional roof hatch. Another inventive feature in this market segment, which the Combo will offer next year, is a sensor-based indicator that, at a press of a button, allows the driver to make sure the vehicle is not overloaded. Extending choices still more, the new Combo also comes with a unique range of assistance systems that make driving, manoeuvring and transporting goods or crew easier, safer and more comfortable. The optional Surround Rear Vision, which the Combo will offer next year, further improves visibility while reversing and a second camera in the exterior door mirror on the passenger side reduces the blind spot on this side of the vehicle. The new Combo can additionally be equipped with the sensor-based Flank Guard system that helps avoid low-speed bumps or scratches on the sides of the car. The Combo’s suitability for professionals is further increased by state-of-the-art infotainment systems that ensure outstanding connectivity. The Apple CarPlay and Android Auto compatible Multimedia Radio and Multimedia Navi Pro systems are easily controlled via the 8.0-inch colour touchscreen. The top-of-the-line unit with integrated navigation including European maps and 3D navigation also offers TMC (Traffic Messaging Channel) updates.